No New York Mets pitcher has ever thrown a no-hitter, but on Friday night vs. the St. Louis Cardinals, starter Johan Santana has just made history, and fans in New york are going crazy. The Mets win 8-0 over the St. Louis Cardinals, and the Hispanic pitcher is the hero of the day. Adam Wainwright’s deep in sixth inning for a three-run homer appears to have sealed a win no matter what the following innings would produce. Santana strikes out David Freese, and it’s over. Strike Three! 50 years in the making, Santana has struggled since he became a Met. If any one deserved it, this fellow sure does. What an amazing game: four walks, no hits, and in a stretch that ran 8,019 games. Santana has sealed his name in the record books. 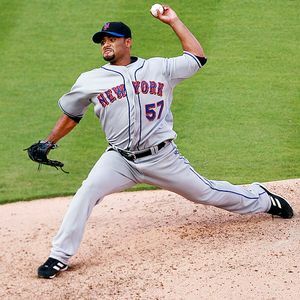 One Response to "New York Met pitcher Johan Santana has just no-hit the St. Louis Cardinals: History making no-hitter"
I’m so happy for Johan Santana and my New York Mets…but if you’re gonna write an article, please learn to spell!!! lol It is Pitcher Johan Santana (not picture) and threw a no-hitter (not through).